It includes asoft white diffuser that will soften the light from the built-in flash, a1/2 warming diffuser that will warm the light, and a1/2 cooling diffuser that will cool the light. UNIVERSAL PRO SOFT FLASH DIFFUSER. LumoPro LP180 Quad-Sync Flash Speedlight for All Camera Makes. Condition is Used. Shipped with USPS Priority Mail. Godox VING TTL Li-on camera flash V860II guarantees better light shooting experience with build-in Godox 2.4G wireless X system, GN60 high guide number, and 20-200 zoom flash coverage. V860II-C applies to Canon EOS cameras and is compatible with E-TTL II autoflash. Package Included: 1 x Godox V860II-C flash 1 x Li-ion battery 1 x Charger 1 x Mini stand 1 x Protection case Features: Build-in Godox 2.4G Wireless X System -Optic transmission with even illumination and stable output. -Build-in 2.4G wireless transmission offers all-in-one functions and 100 meters further transmission distance. .
NIKON SB-28 SPEEDLIGHT FLASH Case included. SS-MS1 Close-Up Speedlight Kit Case. The R1 Wireless Close-Up Speedlight Flash System has a Guide No. 66' at 24mm, with both heads. Built-in target light and AF Illuminator allows for proper position of Speedlight on the subject as well as autofocus operation in low light situations. Because of this, we use pocket wizards in professional situations to get these to flash whenever we need it. It is a common modification that many professionals resort to, when using the 580 EX II's. Canon Speedlite 600ex-RT Flash. Only lightly used. 5 out of 5 stars - Canon Speedlite 600ex-RT Flash in Original Box only lightly used. 17 product ratings17 product ratings - Canon Speedlite 600ex-RT Flash in Original Box only lightly used. Flashpoint Zoom Li-on R2 TTL On-Camera Flash Speedlight for Sony. Shipped with USPS Priority Mail. 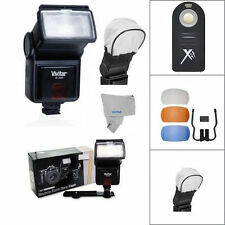 YONGNUO Yn-560 IV Flash Speedlight for Cam Canon Nikon Pentax Olympus / 560iii. Condition is Used. Shipped with USPS Priority Mail. SONY HVL-F32M EXTERNAL SHOE MOUNT FLASH W/POUCH H3026753-02. Condition is Used. Shipped with USPS Priority Mail. FUJI EF-20 FLASH. In Excellent Condition. Graflex Graflite 3-Cell Flashgun w/ Reflector, Mounting Clamps & Cable Cat. 2773. No dents, no corrosion, just some surface marks in the finish. Cable is a little stiff from age, I don't believe there were ever any batteries used in it as the inside is so clean. Please look at all the pictures (12) !!. Pentax AF 500FTZ Shoe Mount Flash for Pentax, used. Condition is Used. Shipped with USPS Priority Mail. Zoom Range: 24-105mm (14mm with Panel) / Tilts from -7 to 90°. Hunt's has been trusted choice for 112 years and we have outlasted many competitors, especially in this Internet age. No problems found. This system also does not need direct line-of-site like traditional optical-based transmission and will work through obstacles. Those may Not be included, only what is listed is included, and Nothing else. Very good condition! Includes plastic cover and case. Tested and working. See pictures for exactly what is included. There is a piece broken off at the bottom. With original box and paperwork. Has aux / 5th battery holder. Condition is Used but nice. Six adapter rings- 49mm 52mm 55mm 58mm 62mm 67mm. Batteries included. It has minor wear and marks. Functionally, this flash is in proper working order. This Nikon SB-23 is ready to use! We take pride in our used inventory, and we stand behind it. Warranty Info. The tube has a 3 pin mount. Flash tube is used, but is still serviceable. will function perfectly, as designed. Very good to excellent condition. Fot the Norman strobe heads LH 2000 and LH 2400. Canon Speedlite 600EX-RT Shoe Mount Flash for Canon. Shipped with FedEx Ground or FedEx Home Delivery. Canon Speedlite 270EX II Shoe Mount Flash for Canon. Condition is Used. Shipped with USPS Priority Mail.